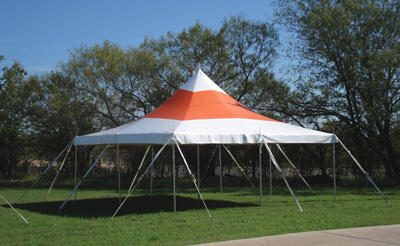 Mystique High Peak Tension Tents are ideal for any social event, but you want to be sure to have a strong, secure frame to withstand the elements. The poles from the pole and stake set for the 30 x 30 tent are made from galvanized steel with triple reinforced stress points to prevent bending, and the 42-inch stakes will give you deep ground penetration to lend even more stability to the entire tent. The kit also comes with tent bags for easy storage and transport. You won't have to worry about your next party with the sturdy but light-weight pole and stake set with custom high-peak engineering.